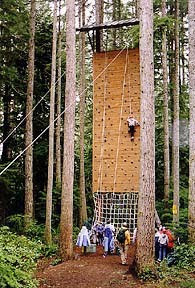 The Catholic Youth Organization provides a residential outdoor environmental education experience for elementary students through the use of hands-on, exploratory, investigative, and interdisciplinary teaching methods at Camp Hamilton, a 570 acre site in Monroe, WA. Explore and learn about their relationship with the natural environment. Increase their understanding of ecological concepts. Gain a deeper sense of community with, and responsibility for, the earth and its inhabitants. Participate in cooperative group living, problem-solving, and decision-making tasks while respecting the diversity each group brings. Experience and develop personal and spiritual growth. Share the wonders of, and celebrate God’s creation. Students spend a large portion of time each day in Exploration Groups out in the field studying the ecology of the natural communities at camp. An investigative approach to learning is used to teach the interconnectedness of people and the natural world. The curriculum is consistent with the Framework for Environmental Education Guidelines produced by the Washington State Office for Environmental Education. During the Forest Community field study, students get to explore the incredible diversity of the Pacific Northwest forest ecosystem. Through active exploration and hiking, group discussions and challenges, games and reflection, students will gain a deeper understanding of how plants, animals, and humans interconnect in this community. Students will develop an awareness of the patterns and designs, structures and functions as well as the beauty inherent in a forest community. They will gain knowledge about life cycles and interrelationships and forest conservation strategies. The Wetlands Community field study allows students the opportunity to perform a pond study using observation skills and scientific equipment. 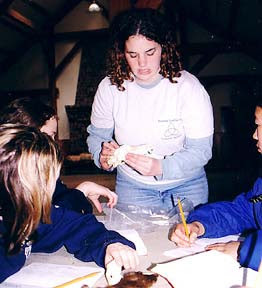 Students will learn that wetlands play an important role in the every day lives of humans, wildlife, and plants. Group discussion and reflection will give students the opportunity to learn the value and function of a wetland. They will have the ability to describe and define a wetland community and identify common plants associated with wetland areas. The Wildlife Community field study cover the topics of adaptation, habitat, and limiting factors. Students will learn that in order to survive, all animals need a habitat that consists of the same basic components. They will have the opportunity to explore a variety of animal signs at Camp Hamilton which can be used as an indicator of population and environmental quality. Students will learn hands-on the adaptations which allow animals to fill a particular niche or survive in a particular habitat. During the Human Community study, students participate in non-competitive initiative activities that focus on communication, cohesion, diversity, and personal and environmental awareness. Initiatives encourage the students to see themselves as capable individuals. Students will learn the value of treating others with respect and dignity, utilize and appreciate rules for group behavior, the benefits of teamwork, and accept personal responsibility for maintaining and conserving the group living environment. 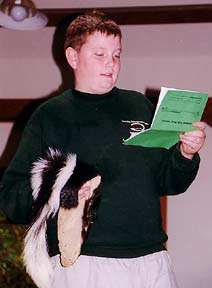 In addition to the academic focus of the Environmental Education program, while at camp students live in an environment that promotes a sense of self-worth and confidence, as well as respect for the rights and needs of others. We schedule schools from different backgrounds together and facilitate positive interactions, generating awareness of commonalities between diverse groups of people while appreciating differences. Students leave Camp Hamilton with a heightened awareness of how their choices impact others. The Catholic Youth Organization’s Environmental Education program teaches students that the Earth is a gift from God, and as stewards of this gift, we must work to protect and preserve it. While at camp, students will experience faith community building through prayer and reflection. Faith-based values are incorporated into all facets of our program. We seek to celebrate the wonders of God’s creation as a faith community.